The premiere of the 8-episode series, based on the Tony Award-winning musical “Million Dollar Quartet,” will mark the 60th anniversary of the famed “Million Dollar Quartet” jam session recorded by Elvis Presley, Johnny Cash, Jerry Lee Lewis and Carl Perkins in Dec. 1956. CMT and Thinkfactory Media will begin a nationwide casting search for the roles of young Elvis Presley, Johnny Cash, Jerry Lee Lewis, BB King, Ike Turner, Carl Perkins and other supporting characters beginning Feb. 3, with auditions to be held at the historic Humes Preparatory Academy Middle School, Presley’s alma mater, on February 13. “‘Million Dollar Quartet’ will capture the star-crossed Memphis moments which led to the most explosive pop culture movement of the 20th Century, the birth of Rock ‘n’ Roll,” said Brian Philips, CMT president. “The characters are all larger-than-life, so casting is a daunting challenge, but we’re counting on the magic of Memphis to come alive again! Gospel Influences on Rock-n-Roll Gospel music was the major influence on Elvis’ interpretation of rock n roll. The Bible-Belt beginnings that differed little from Black allow him fuse two music cultures. Although the South enforced segregation, poor Whites mingled freely with the Black community because they lived in close proximity. Memphis Blacks were luckier than their Southern brothers were as they were allowed to perform to a mixed audience. Beale Street had bars where Blacks performed to a mixed audience. In bars and on radio (Memphis radio broadcast Black music) was where Elvis listened and learnt. What made Elvis’ Rock-n-Roll Different? Elvis made a greater impact because he was a White man that sounded Black. Compared to Frank Sinatra who crooned his way into your heart, Elvis reflected the teenage sexual energy that made a connection with a whole generation. What made Elvis unique was his attitude. He was a rebel with a cause that parents loved to hate – enough reason for most teenagers to embrace Elvis. His music in context of middle American 50’s values was a timely coincidence, and what his generated craved. An idol that reflected rebelliousness defied authority, while demanding we don’t step on his blue suede shoes. Jack Clement got his first big break in the music business when Sam Phillips hired him to be the sound engineer at Sun Studio. Over the years, he’s been a songwriter, producer, recording artist, disc jockey, and Arthur Murray dance instructor. He presided over Jerry Lee Lewis’ first sessions and recorded the “Million Dollar Quartet” at Sun in 1956: Lewis, Johnny Cash, Carl Perkins, and Elvis Presley. Clement wrote “Ballad of a Teenage Queen” for Johnny Cash and “Someone I Used To Know,” which became a hit for Dolly Parton and Porter Wagoner. He introduced George Jones to Dickie Lee’s “She Thinks I Still Care” and produced sessions for U2’s Rattle and Hum. The Million Dollar Quartet, Broadway musical seems to have left out at least one very important character. Jack Clement: Oh really? Who is that? Don’t they have somebody operating the board? No, just Sam Phillips doing it all. Sam went next door to Taylor’s restaurant. 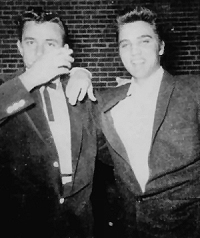 Carl Perkins was in the studio recording, but everything stopped when Elvis came in. Everybody just started swapping stories and picking out songs. And I remember thinking I would be remiss if I didn’t record this. So I moved a few mics around and recorded what happened. Nobody paid any attention to the tapes for years and years. It was a long time before the record came out. In an autobiography, Johnny Cash swears he was hanging out for a long time and that he sang on the album. But it’s impossible to hear his voice on any of the songs. So did he or didn’t he sing on the recording? I can’t really say. 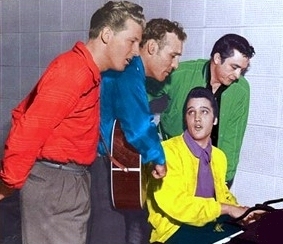 Elvis Presley, Jerry Lee Lewis, Carl Perkins and Johnny Cash. On December 4, 1956, Elvis Presley, Carl Perkins, Jerry Lee Lewis & Johnny Cash got together in the Sun Records Studio in Memphis. The session pinpoints with unabashed accuracy where rock-n-roll got its energy.